Another breed of cat entirely from yesterday’s clydesdales, these are thoroughbreds, and the name says it all. 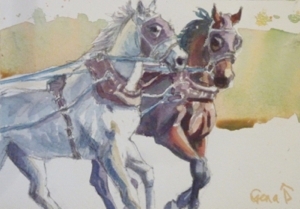 I dare anyone to find anything to compare with chuckwagon racing for it’s value in thrilling action, fabulous horses, thundering speed, and dramatic stories. This is the lead team (there are 2 more hitched behind them) pulling their wagon onto the track for their heat in the races. See you at the track next summer! 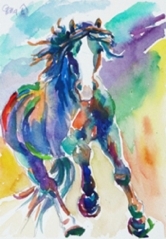 This entry was posted in equine, western lifestyle and tagged (un)limited palette, horses, western art, western lifestyle on January 6, 2013 by Gena. 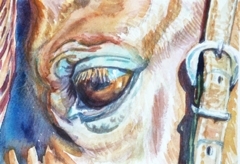 The eye of a horse is a wonder to behold, the depth and beauty being beyond compare. The expressions vary from compassion to comedy, indifference or interest….often curiosity. But the one I enjoy the most is the devilish twinkly humor that is so often there. I think they’re laughing at us most of the time, and with good reason I’m sure. 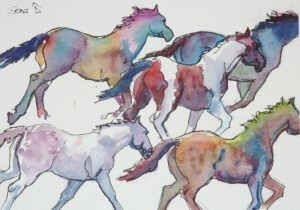 Whatever the expression is, the eye of a horse is a window to a pure and intelligent soul. 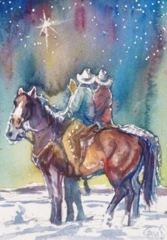 This entry was posted in equine and tagged (un)limited palette, equine, eyes, horses, saddle horses, western art, western lifestyle on January 2, 2013 by Gena. Well today there isn’t a painting. 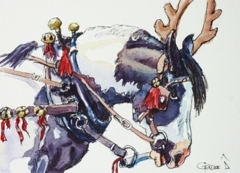 I’ve been in my booth at a Christmas market here for 2 days, with no time to paint…just a scramble from start to finish. It was a lot of fun w ith many old friends and family showing up and lots of visiting….some sales of my new books too, which is exciting. Tomorrow, it’s off to Calgary to retrieve my son from the airport, so it’s not looking promising for then either! 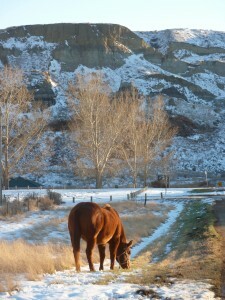 Instead, you get a photograph of my beautiful old mare, Polly, enjoying some sun on the snow and a bit of a graze. 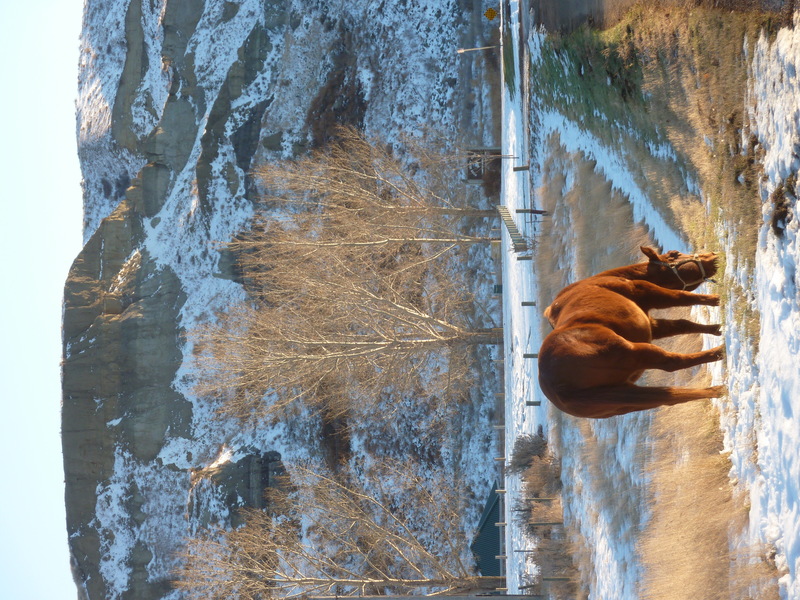 This entry was posted in equine, photography, Uncategorized and tagged Alberta, coulees, horses, S. Saskatchewan River, western lifestyle, winter on December 22, 2012 by Gena. This morning I found a painting of a surreal-looking black horse, and while I loved the colour and movement in the piece, I disliked the fact that the horse was not anatomically correct at all! So I decided to have a shot at it. Rarely do I paint or draw anything that isn’t from my own experience, but it’s fun, once in awhile to exaggerate and stretch reality…like I do with the Spirit Ponies. So here’s my rendition of a wild black stallion…What shall we call him? Why not Toronado…the name of Zorro’s horse. 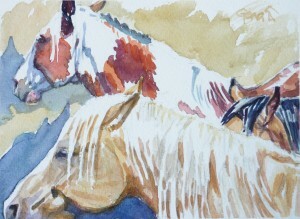 This entry was posted in abstract, colour, equine and tagged (un)limited palette, equine, symbolism on December 8, 2012 by Gena.